Six Dead, One Critical. Shooter Taken Down By Sniper. 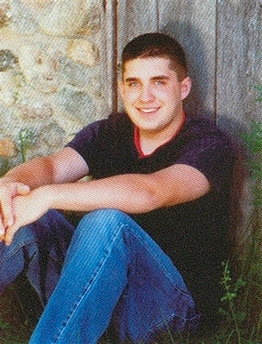 Early Sunday morning in Crandon, Wisconsin, a 20 year-old off-duty sheriff's deputy, in what is believed to be jealousy, burst into a house party and shot to death six high school students and recent graduates. The gunman, whom police identified as Tyler Peterson, was later killed after he evaded law-enforcement officials, forcing this town of 2,000 about 225 miles north of Milwaukee to be virtually locked down by police for several hours. Crandon Mayor Gary Bradley said Sunday afternoon that the suspect was dead. "He was brought down by a sniper," Bradley said. However, Forest County Sheriff Keith Van Cleve would not confirm that Peterson had been killed by fellow officers. Many details were still sketchy late Sunday, but police believe Peterson shot the seven people, ranging in age from 14 to their early 20s, around 3 a.m. in a small downtown home where they had gathered to eat pizza and watch a movie. At least eight people were inside the house at the time of the attack, family members say, after celebrating the local high school's homecoming. While it was unclear what the gunman's motive was, the mother of one victim said he may have been a jealous boyfriend. "I'm waiting for somebody to wake me up right now," said Jenny Stahl, 39, the mother of 14-year-old Lindsey Stahl, who was killed in the shooting. "This is a bad, bad dream. All I heard it was a jealous boyfriend and he went berserk. He took them all out." Savannah Cleereman, 14, knew Lindsey and the five others who were killed. "Lindsey was my best friend since 1st grade," she said. "It's just the way she died. She didn't deserve it. None of them deserved to die at all. I had six friends, but they all died." Cleereman said she had been invited to the same house party but didn't go because she was too tired from an early volleyball meet. Instead, she and a friend—the sister of a young man at the party—stayed at Cleereman's house together. The two learned of the shooting Sunday morning when Cleereman's friend received text messages on her phone from people saying they were sorry to hear about her brother. "Then my mom came in and told me that six of my best friends were dead," Cleereman said. A second victim was Bradley Schultz, 20, a third-year student at the University of Wisconsin-Milwaukee who was home to visit his friends, said his aunt Sharon Pisarek. "We still don't have many details, but from what they've told us, there was a girl next to him and he was covering her, protecting her," she said, sobbing. "He was loved by everybody. He was everybody's son." Three of the victims were Crandon High School students, said schools Supt. Richard Peters, and the other three had graduated within the past three years. "There is probably nobody in Crandon who is not affected by this," Peters said, adding that students would be especially affected. "They are going to wake up in shock and disbelief and a lot of pain." Peters did not know whether Peterson had also graduated from the 300-student high school. But Crandon resident Karly Johnson, 16, said she knew the gunman and that he had helped her in a tech education class. "He graduated with my brother," she said. "He was nice. He was an average guy. Normal. You wouldn't think he could do that." On Sunday afternoon, Crandon residents gathered inside churches and area stores to talk about what had happened. With the hymn "The Glory-Land Way" being sung by a congregation behind him, James Crawford, 36, tried to talk in a phone interview about his cousin who was killed. The Tribune is not identifying the cousin because it was not clear whether all family members had been notified about the death. "I just can't believe something like this would have happened here," he said. Twenty-five people met for hours inside the Church of Christ in Crandon, which Crawford attends. Earlier Sunday, Crawford had learned of his cousin's death when he awoke to a phone call from family members: His teenage cousin, "who wouldn't have hurt a fly," had died in a shooting that had happened only three blocks away. And just when he went outside for a front-yard discussion with his neighbors, they learned from police that their child, who had been at the party, was dead, he said. I'm sorry. I'm sorry for everyone involved. These things are just senseless. People try and make sense out of them, but you just can't. Because people are involved we think somehow we should have could have known. It's no different than a sudden storm, a freak tornado coming up without warning. The odds of one hitting your family are vanishingly small. Which doesn't help at all when it's right on top of you.